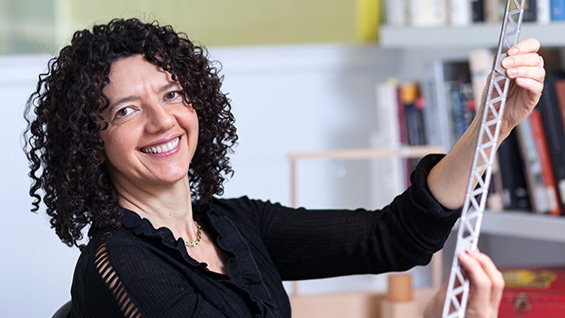 While many serious architectural works can be described as "playful," Tamar Zinguer AR'89, associate professor at The Irwin S. Chanin School of Architecture, has written a book that turns the notions of play in architecture on its head. Architecture in Play (University of Virginia Press), released in December 2015, examines four key toys from the mid-19th to the mid-20th centuries that embodied architectural notions of construction and manipulating form. 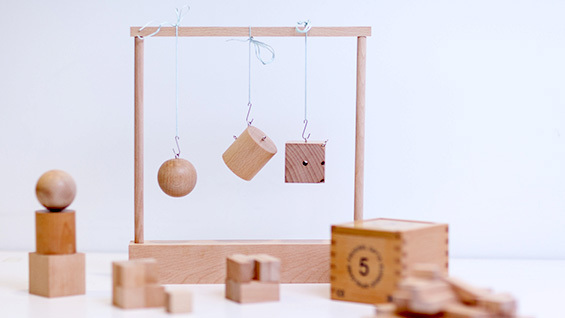 Through these four toys she traces a history of education, changing notions of the value of play, shifts in world sites of mass production and the influence of playful building systems on generations of creators. The subtitle is "Intimations of Modernism in Architectural Toys." The interest in architectural toys stemmed from a happenstance when she began her Ph.D. at Princeton. "During my first semester the director of the Canadian Center for Architecture came to talk about their collection. He showed toys. I was hooked. I did research to see if anything had ever been done on this and nothing had at the time." She went through every box of toys they have, she says, wondering how to narrow her focus. "So one day it hit me to write about different periods and different materials." 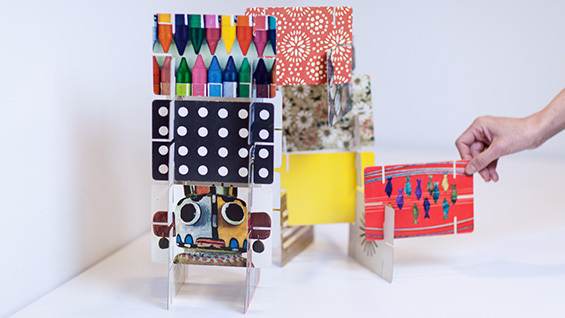 She settled on closely researching Friedrich Froebel's wooden "Kindergarten Gifts" (1836), Anchor Stone Building Blocks (1877), the metal construction systems of Meccano (1901) and the Erector Set (1911) and the Charles and Ray Eames' paper TOY and House of Cards (1952). "Each of them presents a novelty both in terms of production and object design as well as the reproduction of space and material. And these were the most open-ended of their time." The absence of a specific goal during play was key for her. She did not examine Lincoln Logs, for example, because you can only construct one thing: a log cabin. Each chapter of Architecture in Play takes a deep dive into the history and cultural context of one of the four toys. 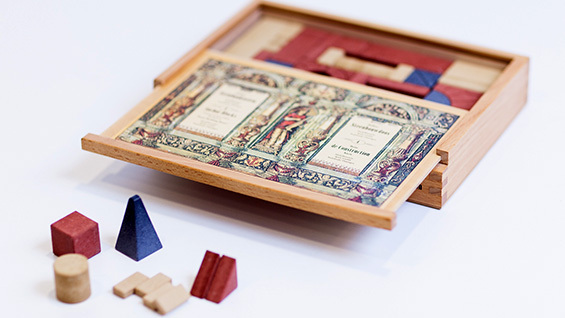 The "Kindergarten Gifts," AKA Froebel blocks, were designed as a structured pedagogical tool to introduce notions of form, volume and the haptic vs. the optic to very young children. The Anchor Stone Building Blocks, small blocks made of colored stone in various geometrical shapes, were among the first mass-produced toys. 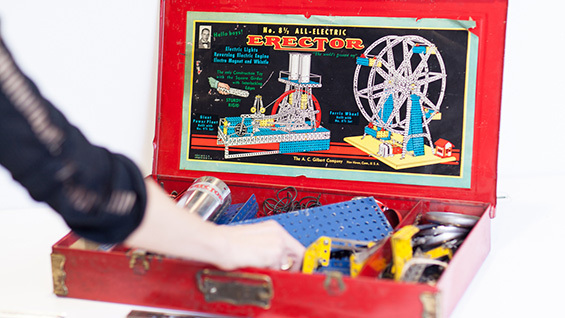 The Erector Set, originally a system of small-scale girders connected with screws and nuts, was a "quintessential American Toy," Professor Zinguer argues, that allowed children to become familiar with a new "adult" construction form. The Eames' "House of Cards" looks virtually the same today as it did in the 1950s. It's a set of cards printed with natural images that can be interlocked using slits along the edges. It speaks to the "possibilities inherent in lightness and flexibility in design," she writes. Architecture in Play has an accessibility both in its writing and its format. The book is filled with full-color illustrations throughout -- there's no inserted gallery section -- thanks to a generous grant that paid for the copyrights and defrayed printing costs. It was critical to the work, says Professor Zinguer, who practiced architecture in Israel, where she also was born. "I build my arguments in the text based on visuals. I wanted to anchor my writing in something tangible. If there is an object I can look back at, to return to the reality of the object." One toy may seem surprisingly absent from the book. "If you ask me Lego probably belongs in this too," Professor Zinguer says. "But you have to be attracted to something to write about it. I never liked Legos as a child. It was the stability of it. Once they are connected it takes an extra effort to take them apart. But at this point I think I could probably write a book about Lego in my own way. I appreciate it more. It's like a pixilated architecture." In looking at architectural toys, "you learn a lot about culture and history, particularly the history of technology," Professor Zinguer says. "The toys I chose reflect the centers of toy production in the world. Until World War I the center of toy production was Germany. After that it shifted to the United States." You also learn about the philosophy of play, how it relates to culture and how the play of children reflects society. Did the author play with architectural toys? "I always had wooden blocks," Professor Zinguer recalled after a moment's thought. "But really I liked dolls," she says, laughing. Prof. Zinguer will be signing copies of the book at a reception open to the public on February 5.